These houses are far enough out of town to escape the urban sprawl but still close enough in to dip in and out of the city within minutes. Friday to Friday rentals in mid and high-season: Rates based on 19 guests: Additional guests supplement €100 per week. Supplement for weddings and events. Low-season 1: (01/1 to 14/6): €5.900/wk. Mid-season: (14/6 to 19/7 & 16-30/8): €7.300/wk. High-season: (19/7 to 16/8): €8.500/wk. Low-season 2: (30/8-31/12): €5.900/wk. Off-season weekend rates starting €2.620 for 2 nights plus €550 per extra night. Ex-guardian's separate small 1 bedroom apartment supplement = €790/wk in high-season to €545/wk in low-season. Newish house, 2007, but working with owners since 2003. Up to 27 or so guests in total of 10 bedrooms, 10 bathrooms + 2 WCs. This is no doubt the house with the greatest wow!-factor in my website. Although not really on the Costa Brava (it is 40 km due north of Barcelona, 2.5 km from a pleasant village near the town of Moià) this property deserves to be seen so I have decided to put it into both the Costa Brava and the Barcelona listings. This is a massive, luxury (again, the L word is justified) mansion on a 10 hectare hilltop property in the middle of a natural park reserve, with heated 29ºC indoor pool & large unheated 16x7m outdoor pool. The location and the views from the grounds are tip top, but what really sets this house apart is the impressively high quality of its interiors. 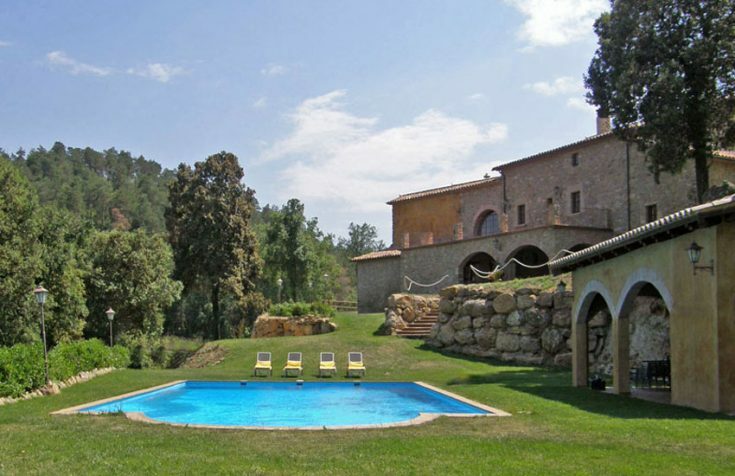 Not inexpensive but do take a look at what a luxury Catalan masia/farmhouse looks like! Free Wi-Fi internet. Now increasingly in demand as a wedding celebration and event venue now that the owner's daughter is handling catering/decorations/live music/photographers, etc. Check with me for a quote.